In this slide, David Armano describes "agility" in terms of design in creativity and planning. 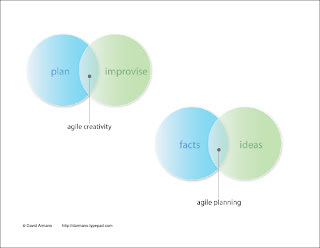 Under "agile creativity", we have plan and improvise. Planning is the bailiwick of the J type in the myers briggs type code, which translates as extraverted judgment (in combination with introverted perception). Improvisation is the bailiwick of the P type in the MBTI, which translates as extraverted perception. Agility is the jungian transcendant function between these.